(Tyler Durden) Update: Law enforcement sources told CBS the suspect has been identified as 29-year old Sayfullo Habibullaevic Saipovm of Tampa, Florida. Sources told CBS News that Saipovm yelled "God is great" in Arabic when he exited the vehicle. Saipovm is an Uzbek national who came to the US in 2010, according to NBC. As Gov. Cuomo said during a press conference Tuesday evening, Saipovm is believed to have acted alone and there's no evidence of a wider plot. Update (5:35 pm ET): President Donald Trump, who has been briefed on the incident, has tweeted that "law enforcement is following this closely..."
In an attack that bears the hallmarks of recent terror assaults in the UK, Spain and France, a truck veered into the West Side Highway bike lane at 3:15pm on Tuesday afternoon, and mowed down cyclists and pedestrians, leaving at least eight dead and up to 15 injured near Chambers Street and West Street, near Stuyvesant High School in lower Manhattan. Police Chief Jim O'Neill said two children and two adults who were on the bus are among the injured. Six people were pronounced dead at the scene between Houston and Chambers streets, FDNY commisisoner Daniel A. Nigro said. Two others were in traumatic arrest and pronounced dead at the hospital, Nigro said. More than a dozen people were hit when a Home Depot rental truck zoomed at least 10 blocks down a popular bike bath from West Houston to Chambers streets according to NBC. Witnesses at the scene said the man also hit a school bus at some point during the alleged rampage. Sources added that the driver hit a school bus at Chambers street and got out of the vehicle with a gun. Police confirmed that the suspect was waving an air pistol and BB gun when police reached the scene. The suspect was shot in the abdomen before being taken into custody. The NYPD has released a recording of a press conference with NYC Mayor Bill DeBlasio, Gov. Andrew Cuomo, and Police Chief Jim O'Neill. Discussing the incident, Mayor Bill De Blasio said that the attack was a "cowardly act of terror" and that an investigation is under way. A U.S. counterterrorism official told NBC News that the intelligence community is unaware of any claims of responsibility in the attack at this time; a police source said authorities are exploring for any international ties. "A guy got out with his biker jacket and started shootin gup the place," he said. "All the kids were in the courtyard at P.S. 89 and started running." The suspect was then shot by police, according to sources. He's in custody, police say. Students from Stuyvesant High School and other witnesses in the area tweeted that they'd heard gunshots. A message has been left with the Department of Education. A large number of police vehicles could be seen near West Street and Chambers Street in Tribeca, which is near a community college, Stuyvesant High School, and a few blocks north of the National Sept. 11 Memorial. According to audio recorded by the service Broadcastify, the NYPD cleared the area around the truck to bring in bomb squads shortly after the violent episode. “Box truck on Chambers and West, we need that area cleared,” said one officer. “We need everybody away from that truck." 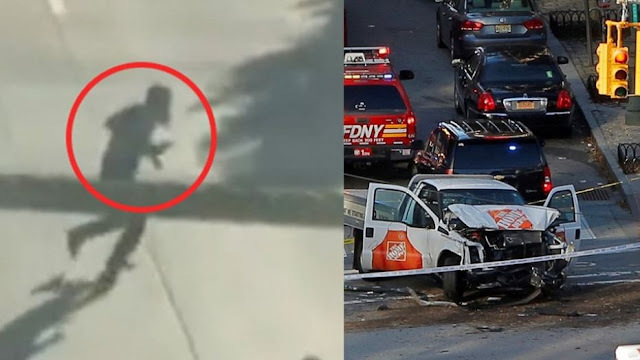 The Daily News reported that the suspect's truck jumped the curb at Houston St. at 3:05 pm and began bearing down on the unsuspecting bicyclists. At Chambers street, the bus collided with the school bus. The subject got out brandishing what appeared to be two handguns. He was swiftly shot and subdued by an NYPD officer. The off-duty chef watched in disbelief as the driver of the speeding truck ran down a pair of CitiBike riders about 50 feet apart, catching both from behind on the busy bike path alongside the Hudson River. There were visible tire tracks on the bodies of the two victims as the truck continued to carve a path of carnage through the neighborhood, he said. The suspect was arrested on West St. a few blocks north of the World Trade Center. Home Depot, in a statement, said they were cooperating fully with the mass killing investigation. Witnesses reported seeing a gunman firing from inside the Home Depot truck [sic], and video showed a badly damaged truck from the home improvement store sitting on a median. “He shot about 15 times toward the pier and down West St.” one witness told the Daily News. The smell of gunpowder hung in the air as police shut down the scene. A grisly video taken immediately after the attack shows what appear to be four bodies lying face down on the pavement. The vehicle also collided with a school bus carrying students from Stuyvesant High School. NBC aired the following footage shot by high school student of purported assailant in Manhattan. Police say they are not looking for additional suspects. Several nearby buildings, including Stuyvesant High, were placed under lockdown. The FBI's New York field office is also responding. The attack occurrred at 3:15 pm Eastern Time. NBC has confirmed that the incident was a deliberate attack. “What happened was there was a car crash … he came out of one of the cars. He had two guns,” a 14-year-old Stuyvesant High School student said. “We thought it was a Halloween thing. He started running around the highway. There was another guy in a green shirt that was chasing him around.” “I heard four to six gunshots — everybody starts running,” she added. "I saw a truck - a white pick-up truck - going down the bicycle lane and running people over," one witness told CBS. Singer-songwriter Josh Groban tweted that he heard gunshots at the scene.